Motorbikes, carcasses, pollution – they might give you second thoughts about traveling to Vietnam. So you’re traveling to Vietnam. You have your guidebooks. You’ve read the posts on the big travel blogs. Let me give you a reality check about Vietnam before you drown in travel brochure superlatives. Here are a few things you really need to know about traveling to Vietnam. I’m basing this on my own experience – just more than two weeks in late 2013. I spent the first few days wondering if traveling to Vietnam was a mistake. The Ho Chi Minh City traffic gobsmacked me. When I blew my nose, the snot would be sooty, like when I worked at my dad’s machine shop (yay, particulates!). Walking around on the sidewalks required navigating through a warren of parked motor scooters, sidewalk cafes and people trying to rent or sell you just about everything. 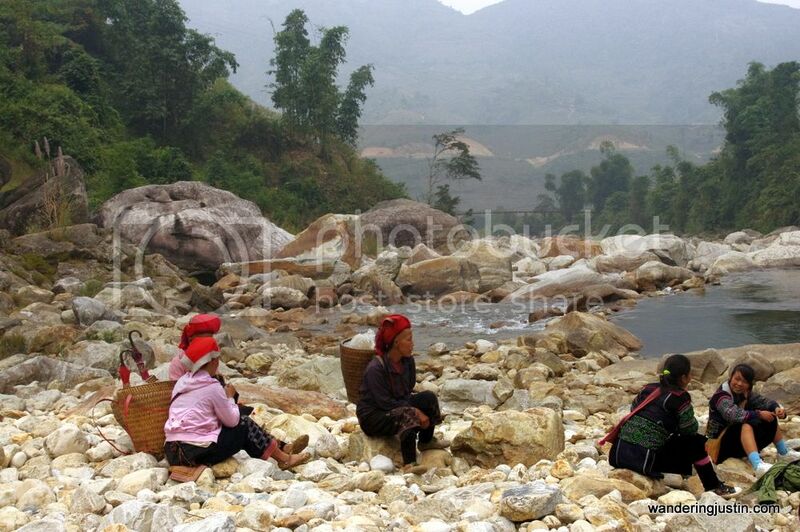 Vietnam’s scenery might not pop … but it’s people do – Red Dzao (left) and Black Hmong (right) alike! Here’s the good news: If you are at all adaptable, Vietnam will start to grow on you. The constant human contact will become more appealing, even as the pollution grows more appalling. Even months after I returned home, my home city still feels empty and distant to me. I still miss eating in places that have four-item menus and serve their meals on tiny tables. 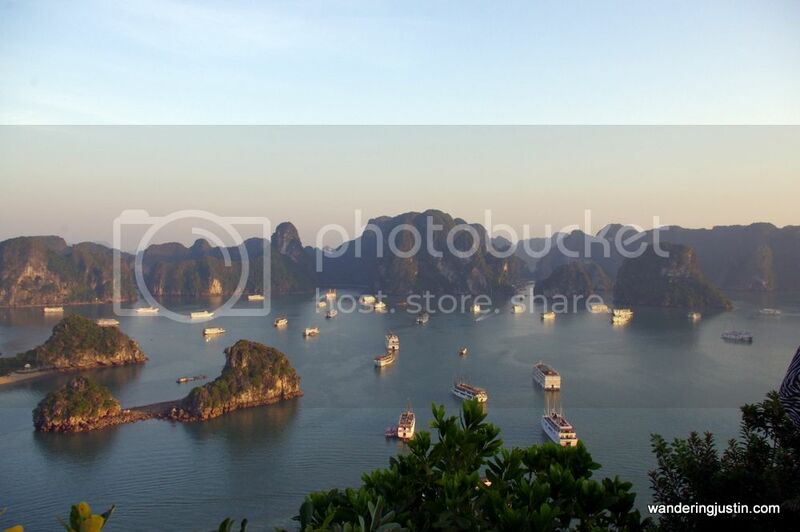 You’ve seen the photos of Halong Bay Vietnam, and probably some from the enormous limestone caves. All nice. But … for the most part, there’s a washed-out grayness to Vietnam. It might’ve been the time of year and the humidity and the pollution. It all combined to take the sheen off the colors. Yeah, you can recover some of it in a photo-editing program. Bottom line: If you’re traveling to Vietnam, don’t expect it to dazzle your eyeballs like Norway or New Zealand. There, the colors explode. In Vietnam, they make a mute little pop. Traveling to Vietnam is, so far, my most interesting cultural experience. From Dia de los Muertos to the Haka, different cultures beat me over the head with a cacophony of “I’m important, and you need to learn about meeeee!” It makes me tune so much of it out. 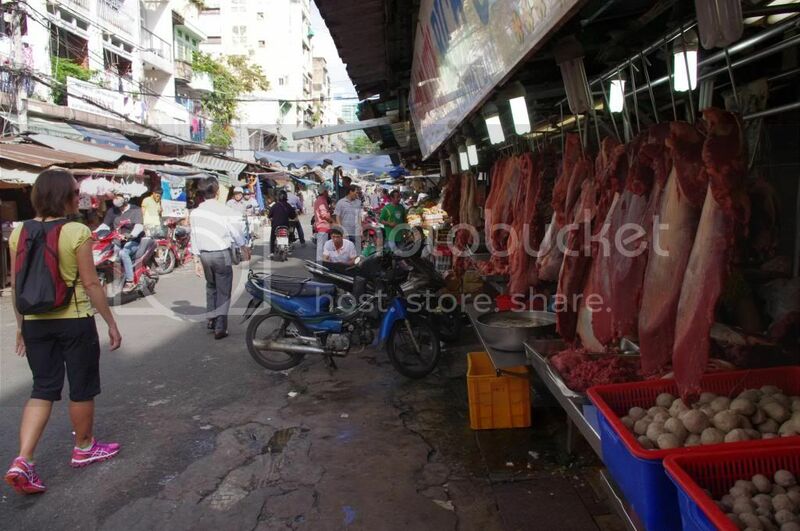 If you’re traveling to Vietnam, you’ll find a more subtle enticement to hooking your interest. Vietnam at its absolute prettiest. I found locals and guides less likely to hose me down with facts, and more likely to offer choice tidbits. Those tidbits were enough to get me to ask questions. Whether I was at the Cu Chi Tunnels wriggling through tunnels or poking my nose into a Red Dzao wedding, I heard and saw things to spur my curiosity. I heard you can be drunk and lazy if you want. Okay, so you want a typical beach vacation. But you want it someplace exotic that will make you sound more adventurous than someone going to Puerto Rico. Gotcha. I hear that Nha Trang is the place for that. Russians love it, and they flock there for alcohol and sun; there’s even a direct flight from Moscow. You probably underrate traveling to Vietnam. I was talking with a couple of co-workers; one of them mentioned how he knew a couple that was trying to decide between going to Vietnam or France for their honeymoon. “That’s a no-brainer,” piped the second co-worker. That pearl of wisdom came from someone who’s never so much as cracked open a travel guide about traveling to Vietnam … and probably buys into the inflated romanticized notions of western Europe. Vietnam would be a fine place to spend a honeymoon, especially if you get away from the big cities. Your money will go far and let you level up on luxury. It can be very quiet and tranquil. And yes, the beaches can be spectacular. So don’t speak from a place of ignorance – learn about going to Vietnam before you rush to ill-informed judgments. “for the most part, there’s a washed-out grayness to Vietnam. It might’ve been the time of year and the humidity and the pollution. It all combined to take the sheen off the colors. Yeah, you can recover some of it in a photo-editing program. In fact, perhaps you travel on a rainy day so you don’t see the blue sky over the bay which is enormous and extremely beautiful. Is that you travel in winter from December to March ? The best time to visit Halong bay is May – July and Sep – early Nov when the weather is dry, sunshine and sometimes cool. The sky is not interfered by gray clouds, the sea is blue, the junks are white, the limestone mountains are blended between dark, blue (reflecting from sea waves) and white. All makes a perfect photo. Hi, Mark. I notice that you you work for a company called “Vietnam Cheap Packages.” I think that indicates that you have a vested interest – to the point of bias – in people buying into the overly manipulated and sanitized images of Halong Bay. That’s your livelihood. So, while I’m sure you don’t advocate for what I said, it’s the truth. For the record, I visited Halong Bay in October for three days, and was in Vietnam for 14 other days, too. Hi Justin, nice post bro. someday maybe you have plan to traveling to Bali , please feel free to contact me, if you have created your own tours according to your wishes, and i will help you to make it happen.